A lot of egg-based breakfasts call for either sunny-side-up or fried eggs (like this breakfast sandwich), but a couple of people in our family are not fans of runny yolks. We usually remedy this by using egg whites, but that causes the problem of wasting yolks. It’s nice to find an interesting breakfast dish that everyone will love! This is far from the most photogenic dish ever, even among egg dishes. But let me tell you, even if you hate scrambled eggs, there is a likely chance that you will love these. They have a large amount of spinach (healthy! yay! ), some diced onion, and plenty of melty Parmesan cheese. Some crushed red pepper on top adds a little bit of kick to the final dish. These were great on top of a toasted English muffin. 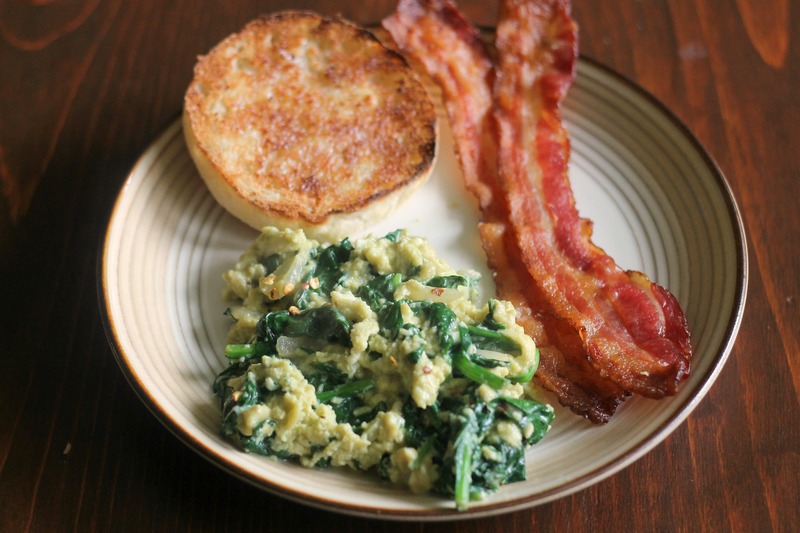 Served with some bacon, you have got yourself a pretty awesome (and easy) breakfast. Crack the eggs into a small bowl and whisk until combined. Season with salt and pepper to taste. Set aside. Heat a medium nonstick skillet over medium heat and coat with olive oil. Add the diced onion and cook, stirring occasionally, until beginning to brown (about 10 minutes). Add the garlic and cook until fragrant, about 30 seconds. Add the spinach (in several additions if necessary) and cook until wilted. Add the eggs and cook, stirring occasionally, until just set (about 1 minute). Be careful not to overcook! Stir in the Parmesan and red pepper flakes. Serve as desired and enjoy!